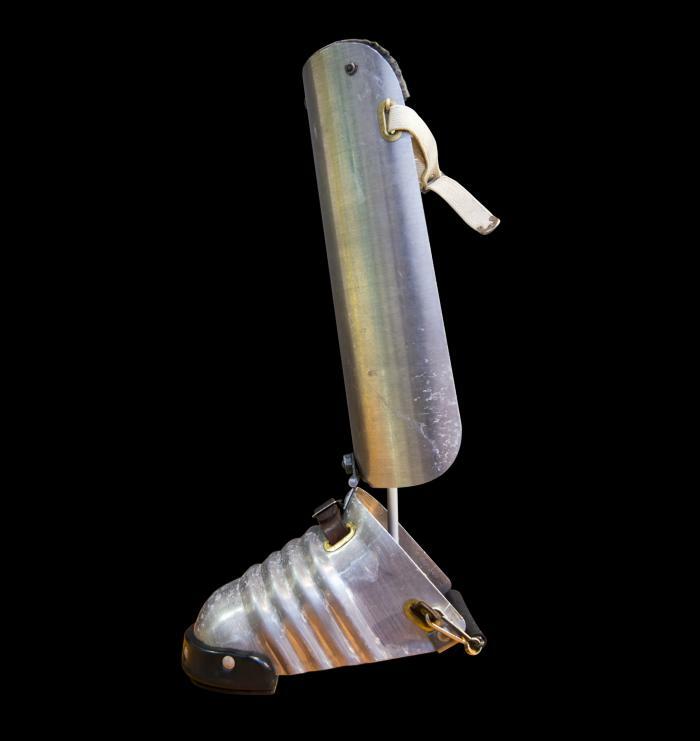 Reminiscent of medieval armour, this foot and shin guard was actually designed to increase workplace safety at the lumber mill. Made of lightweight aluminum alloy, it was used by workers in the mill’s “wood room.” Logs entering the mill through the “slasher” would be cut into four-foot lengths to be fed into large drums to be debarked. If debarking was incomplete, workers would then use a sharp pick to drag the logs off the conveyer and feed them back through the drums again, at which time the pick could bounce dangerously off the log and strike the worker on the foot or shin. These guards were used by mill workers of the E.B. Eddy Company, a long-standing paper and pulp business of Hull, Quebec, that was originally founded in 1886. Made in Ellwood City, Pennsylvania, USA.